If you are a subscriber to Paper Pumpkin you should of received your July kit by now. If you are not a subscriber watch the video below to see the "surprise" products inside the kit. Not only do I love the little diamond shaped boxes which are great for holding little treats, but in this kit you also get a new In-Color Emerald Envy Ink Spot, a Photopolymer Stamp Set that you can use over and over again, and left over tags for another project. I have seen some alternate ideas for this kit, such as sponging red and green over the boxes before they are put together to make cute Christmas Tree Ornaments, so the possibilities are endless. I am really hoping they have refills for this kit soon because I will be stocking up on more boxes to have on hand for parties, thank you's, teacher gifts, and any occasion where I want to take a small gift, all wrapped up in a very unique box. Another thing I want to share is that you can always alter the project inside. In December we received a kit to make a monthly calendar page for each month. When the months are over you can take off the calendar part and use the background to make a card like I did in the card posted below. This was the January calendar page. 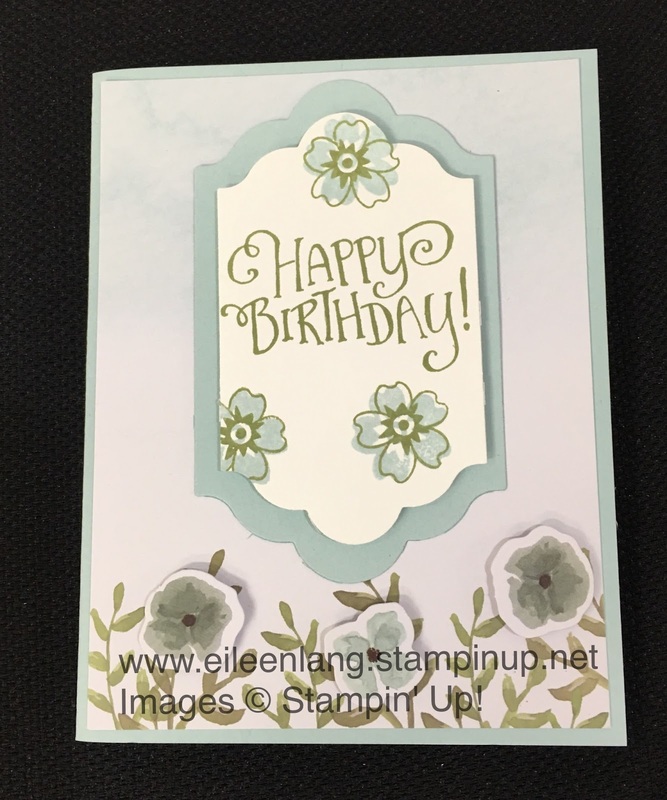 I just took off the month and added my Birthday Sentiment and stamped flowers, added another piece of Pool Party Card Stock and both were cut out and layered onto a Lots of Labels Framelit. So with this kit I will now have a layer for 12 cards once each month is over. Each kit comes with at least one Classic Stampin’ Spot with every kit. The colors don’t repeat in a 12-month period, so it’s easy to build a collection of colorful ink. If you are a new subscriber you will receive a clear block (size D) with your first kit to help you get started and to use throughout your subscription. It’s an incredible value! In addition to a stamp set an ink spot(s), the kits are packed with supplies many to make awesome projects like cards, home décor, gift packaging, and more. For example, the card kits (6+ per year) always include 8 cards—at least! Every month, Stampin' Up! shares a video to quickly demonstrate how to assemble each kit. Just go to PumpkinHowTo.com to link over to our YouTube channel. 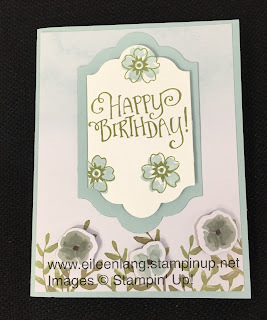 You can create the project as Stampin' Up! intended, or get a little creative and come up with your own alternate ideas. As your demonstrator I will be happy to work with you to come up with new ideas. Every subscriber has exclusive access to Stampin' Up's! selection of past kits. So, when a kit runs out, you can buy more—either as a full kit or a refill (without stamp set and ink). This is good only while supplies last. Hosts can earn Stampin’ Rewards on prepaid subscriptions, making earning even more Free products easy. Check out my Paper Pumpkin link https://mypaperpumpkin.com/en/?demoid=2058927 or click the link in the upper left hand column of my blog. Here you can easily sign up for one month, or do prepaid subscriptions. Item numbers and prices listed below.